The fashion end of the Bengal Stripe. Wear this purple Bengal as a dress shirt with a plain tie for business or open necked for after work socialising. 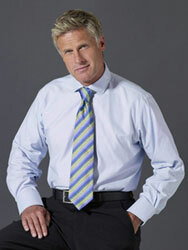 WH Taylor’ shirts are made from two fold 100% cotton poplin. The standard weave( 2 x100's) gives a durable yet smooth finish with a medium English fabric weight. This weave tends to gives the surface colours prominence, making poplin excellent for the sharp checks, stripes and end on ends in which we specialize.